The most obvious and major benefit of a Water Of Life Fountain system as a WoLF Installation is that it provides structured water for your entire home and its much easier to access the water where you want it. You won’t have to lug a container of water from a kitchen installed ‘stand alone’ unit to the back porch plants and garden or brush your teeth and wash your hair with in the shower. Just turn on your garden hose or the bathroom faucet and the best water available is right there to make your life healthier. Studies have determined that the average water absorption through our skin during a typical shower is roughly 1.5 liters. So in one shower alone, you may be absorbing 10 times the legal limit of chlorine into your system. So bathing and washing with our Quantum WoLF Water from a whole home WoLF installation is a massive improvement in your holistic health care and stress reduction. And the structured waters “soft water” attributes makes washing and hair care feel better and more manageable. Make your laundry cleaner and softer with it. Depending on hook up, you could potentially treat your pool and hot tub with it too. 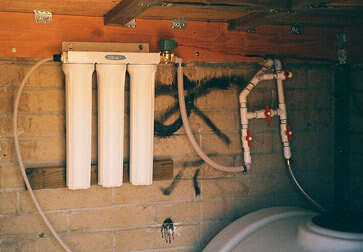 A whole home WoLF installation reduces deposits in your plumbing and pipes. You can also cook with it, water your pets and plants, irrigation systems, wash foods and store foods fresher, vitalize your recipes, make tinctures and treatments and of course drink it for increased health benefits. The only limit to it’s use is your imagination. Throughout your entire home, the quality of life and health should noticeably improve with a WoLF installation. 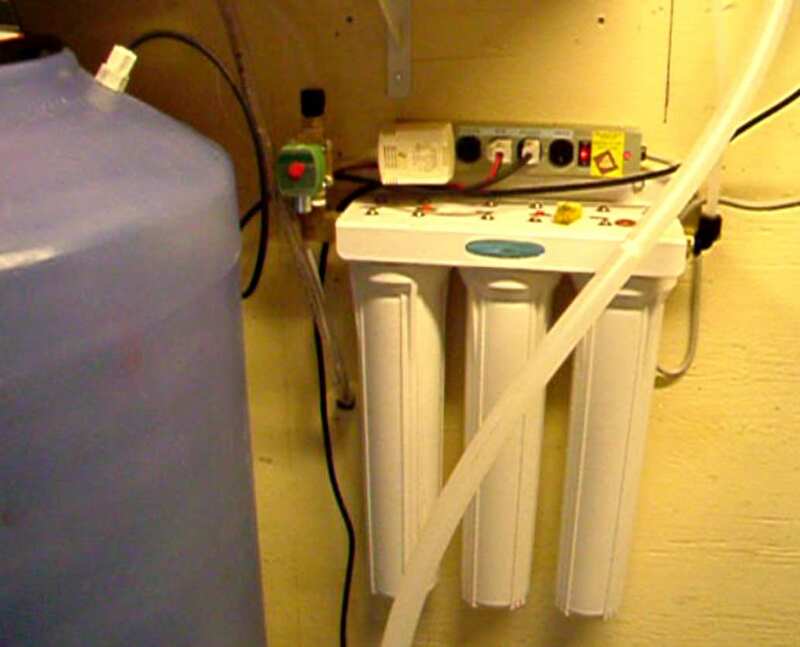 Optional Pre-Filters of your choice to treat your specific water supply and needs. 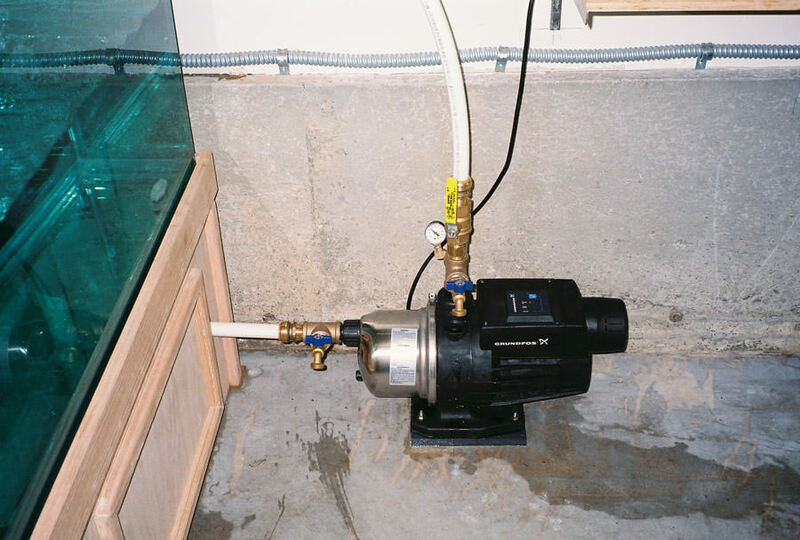 Smart Pump – to pressurize house supply lines. 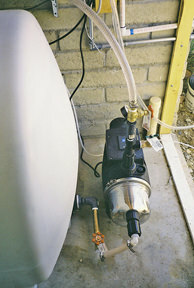 The pump can detect small changes in supply pressure in the house. If you turn on a faucet, the pump detects the change and turns on and then stays on for 5 seconds after the faucet is shut off again. 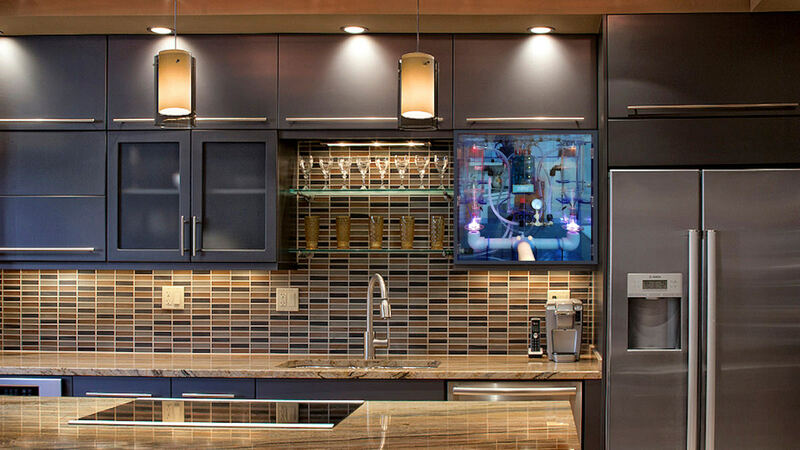 It also has a small built in pressurized reserve of water so it does not constantly cycle on/off with a drippy faucet. Holding Tank Float Switch – controls power strip and turns on solenoid and flow for automatic refill and shutoff. Solenoid – automatic valve controls water flow to the WOLF. Custom electrical outlet for pump and WOLF. 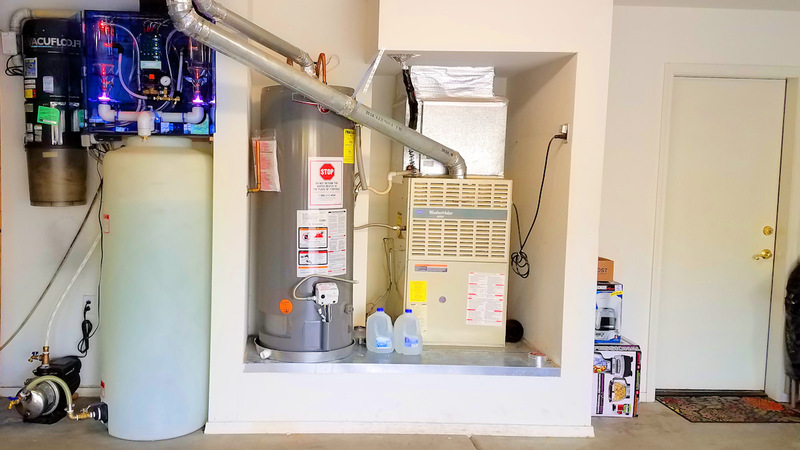 If we do not perform the WoLF installation for you, we can give you the overall plans that a certified plumber can follow. Just ask. You can order all the major parts through us or you can procure parts for your own design. Give us a call for more details. Also see our WoLF SPECIFICATIONS page. These 3 photos are not functioning installs but rather depictions of such to help you generate your own ideas. 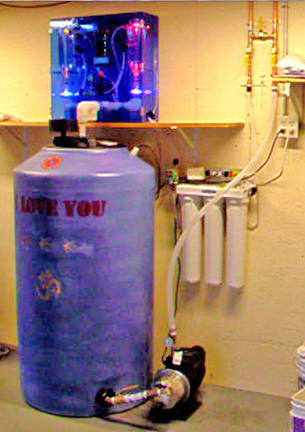 Entire home system with smart pump at foot of tank. 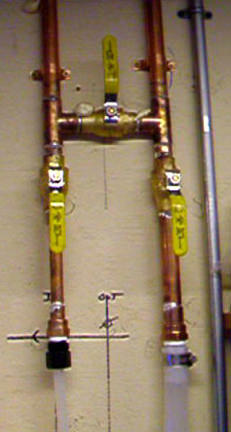 The left copper pipe is the inlet to the system. The middle valve is a bypass valve. 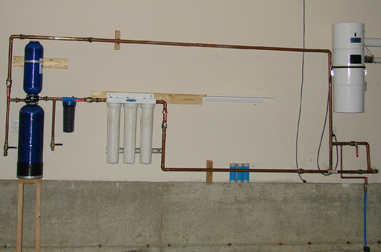 The right pipe is the outlet from the system returning to the home supply. Pre-Filters, Customized Electrical outlet, Green Solenoid Valve. The black wire going into tank is to the Float Switch inside. Top of tank. In this case, it’s a direct feed from the structuring machine to the tank. This shed had a very low ceiling. It is located in Tucson where freezing is rarely a concern. We had to choose a horizontal tank due to height constraints. To the right you see the inlet and outlet pipes for the system with the bypass in between. 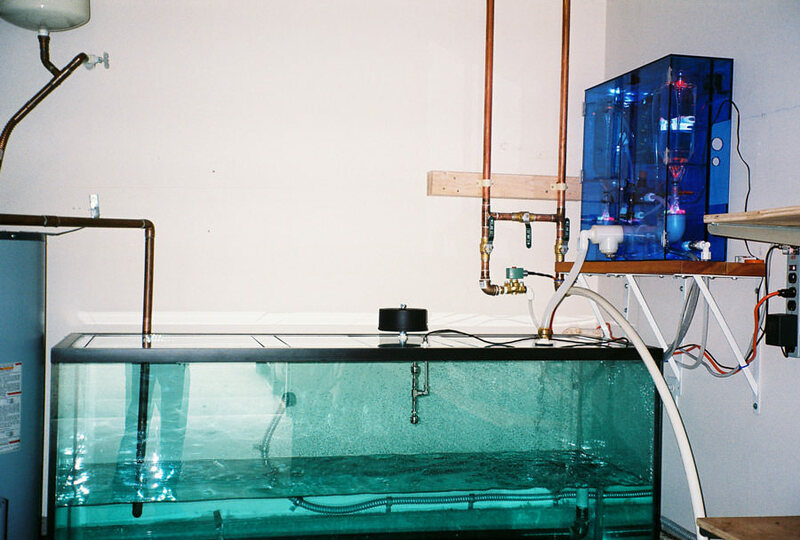 The inlet goes to the pre-filters first….to the left. The home owner had already used PVC pipe to the shed. We recommend NOT using PVC pipe because it contains known Endocrine Disrupters. 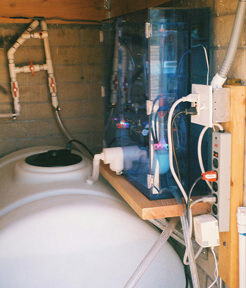 …and finally the Smart Pump at output of tank just in front of shed door. 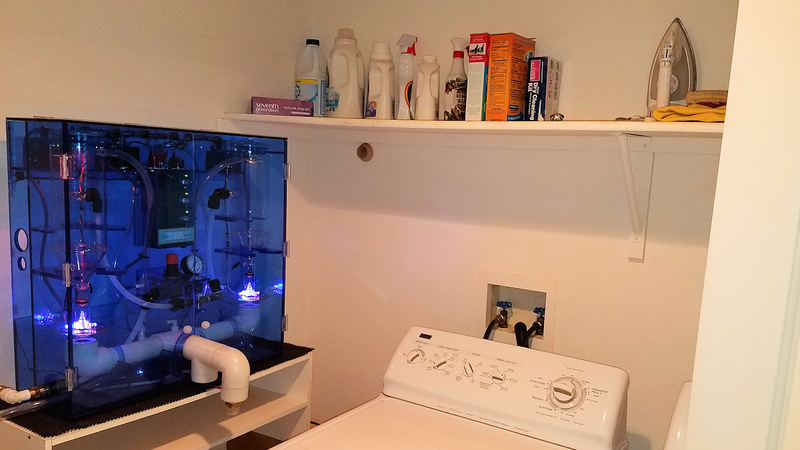 As you can see here, the buyer used an aquarium for the fill tank! 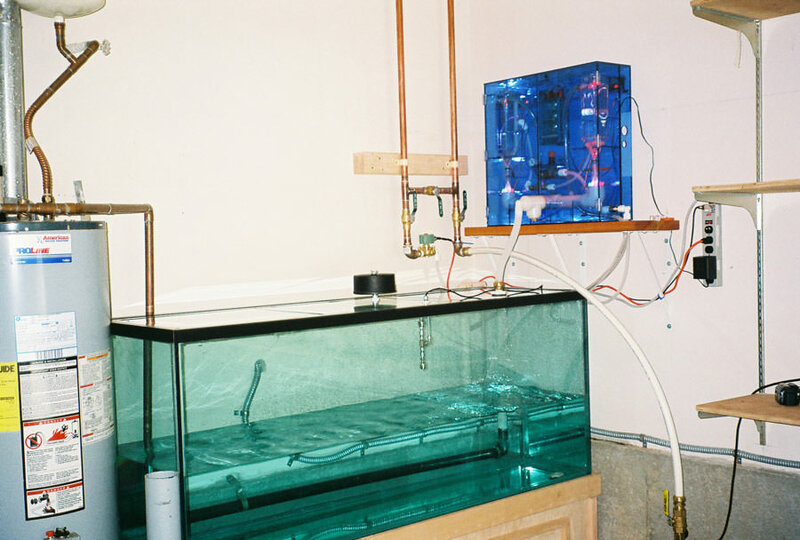 Inside the aquarium, right underneath the black breather atop the tank, is a unique upper and lower limit level switch. 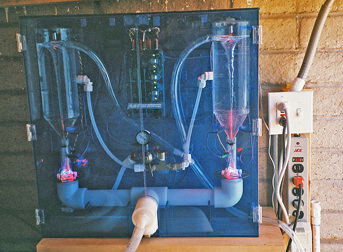 On the left hand side of this picture is the Green Solenoid Switch controlling water flow. It gets turned on when the tank sensor says its low and turned off when the tank is full. At the same time, the electrical control box for the Water Structuring Machine itself is turned on and off. 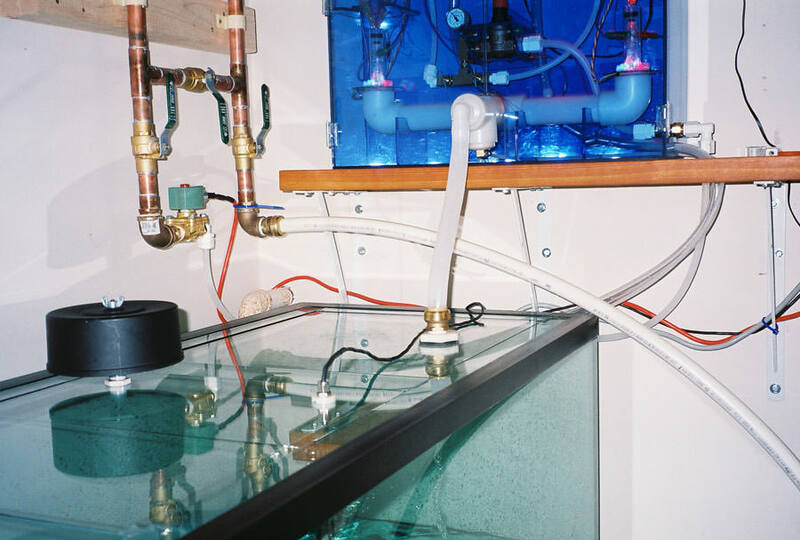 The system is completely automatic with no moving parts except for the float valve. 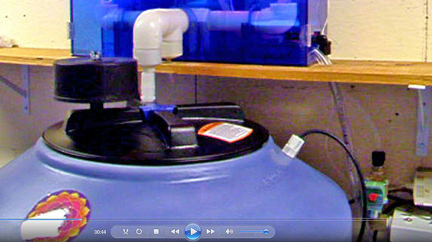 And at the base of the tank frame is the Smart Pump pressurizing water back to the house system. Here is the customers choice of pre-filter plumbing that was installed by himself and a plumber. The tank to the right is not part of the system It is a built in Vacuum tank.